UAE offshore patrol vessel Arialah (note the concept above is incorrect in that the gun is a BAE 57mm rather than the 76mm illustrated). DefenseNews reports first impressions of a new Offshore Patrol Vessel (OPV) built for UAE’s Critical Infrastructure and Coastal Protection Agency (CICPA) shown at the NAVDEX (naval) portion of the IDEX international Defense Exposition in Abu Dhabi. The ships are 67 meters (220 feet) in length, 11 meters (36 feet) of beam, and 5.4 meters (18 feet) of draft, with a speed of 20+ knots provided by four MTU engines driving four propellers. Most of the armament is typical OPV, a 57 mm gun and two 30mm auto-cannon in remote weapon stations. 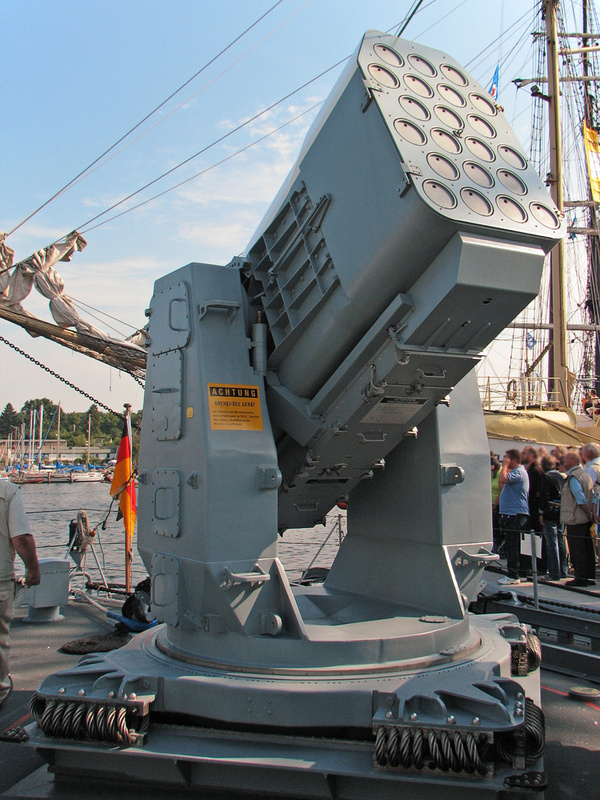 What really sets it apart, is the Mk49 Rolling Airframe Missile launcher. On the other hand, the UAE is just across the Straits of Hormuz from Iran and their shore based anti-ship cruise missiles. An earlier post provides a bit more detail on the program but it appears to have a couple of errors regarding the weapon systems (indicates a 76mm as seen in the first illustration vice 57mm and says the Mk49 launcher has 11 cells rather than the actual 21). There are to be two of this class, both to be delivered this year. 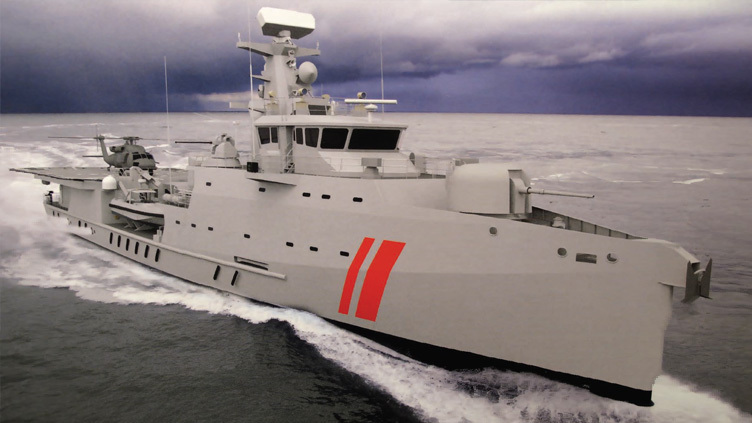 This looks like a straight forward adaptation of one of Damen’s designs for Offshore Industry Support Vessels with boats, helo deck, ESM/ECM, weapons and sensors added. According to this older source, the Coast Guard was involved in the development of the SEA AXE Bow. This entry was posted in AAW, Asia, Middle East, Offshore Patrol Vessel, OPV, Shipbuilding, Ships, WMEC by Chuck Hill. Bookmark the permalink.